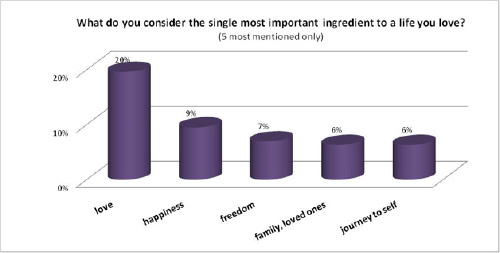 What do you consider the single most important ingredient of a life you love? If you didn't participated in the Flash Research Project I recently ran on this question, take 30 seconds to think about what your key ingredient is. Then read on and find out what the 158 respondents to my informal poll have said. If you did participate, just remind yourself of what your key ingredient was. OK – you've got it? Love, in the widest sense of the word, came top very clearly, including loving unconditionally, being loved, and accepting unconditional love. It also extended to loving ourselves, the people and experiences in our lives, and all that we do. Happiness - in both personal and professional life – was the second most mentioned key ingredient. And Freedom was the third – being able to think for ourselves, and have choices and the flexibility to live and work as it suits us. What is your first response to these results? Well, I believe that what we view as the single most important ingredient of a life we love is likely to reflect what we value. Perhaps the key ingredient you mentioned is a hard-won quality in your life, or represents a breakthrough in your own personal development, and you cannot imagine ever going without it. Or maybe your key ingredient is a quality you are sorely missing, or are working towards, one you believe can completely transform your life when you acquire it. So what does your key ingredient say about you? • Is your most important ingredient for a life you love among the 5 most mentioned ones? Is it among those mentioned by fewer people, or is it something else altogether? • Does this surprise you? Why or why not? • What does it tell you about yourself? • What made you choose the ingredient you picked, over other ones you could have named? • If I’d asked you the same question 10 years ago, would you have named the same ingredient, or was another more important then? • How is the most important ingredient of the life you love shaping your choices and your current life? • And can you observe yourself actually acting in accordance with your key ingredient, or is it an aspiration that you’re striving towards? A story emerges – what’s yours? For me, one – if not the – key ingredient of a life I love is freedom: The freedom to create my life and work as an authentic expression of myself. The freedom to live and work, as much as possible, in harmony with my natural rhythm. The freedom to follow my gut feeling, and make my own decisions and mistakes. Yet it took me a while to realise this, and start aligning my life with it. The studies, projects and work I was immersed in my earlier professional life were held in tight organisational and corporate structures. These set the standards, values, and pace for my living and working. For a long time, I put financial security and learning over freedom. I might have felt constrained; I might have longed for more freedom, but as long as I was earning and learning, I made myself fit in. And it probably served me well, at that time. Then a drastic change in my work circumstances catalysed my leaving the corporate world, and set me onto a different path. I resisted committing myself to a next job straight away, and instead gave myself time and space to reflect, experiment and see what would emerge. Without externally driven schedules to structure my days, I had to create my own. And in order to create my own, I had to know better what I was really about, what was important to me, and what I wanted to be guided by. And that was the beginning of my inquiry and journey into the life I love. I still love to learn and grow, but have learnt to follow my desire for freedom while managing my legitimate need for security. And through experimentation, successes and mistakes, the life I love has gradually taken shape. How aligned is your life with your key ingredient to a life you love? How important is this to you? And what could you do in order to align it even more? Notes: The 158 people participating (87% women, 13% men) did so purely out of interest in living a life they love. They are either part of my circle of family, friends and colleagues (35%), on my mailing list (19%), or members of various eCommunities (46%). They live in the UK, Switzerland, Italy, Spain, the Netherlands, Dubai, and Greece. The youngest respondent was 10, the oldest 75 years old.